A few years ago a couple of friends were talking to some girls and asked them where they were staying on their Vegas vacation. The girls answered “Terribles”. 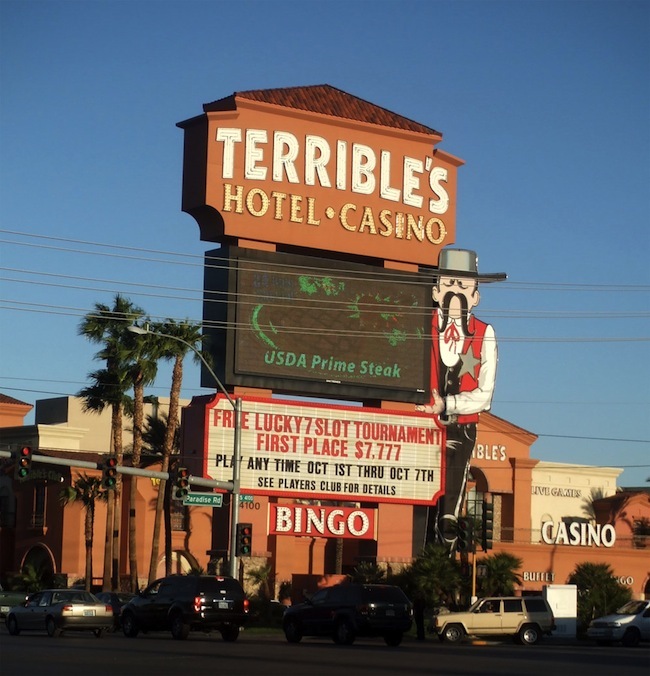 Never hearing of Terribles Casino my friends asked the girls if they were staying in a gas station. Until that point the only Terribles my friends and I had ever seen or heard of were gas stations. Well, those girls can no longer stay at Terribles Hotel and Casino. After undergoing a $7 million facelift the property is now called Silver Sevens. …“We went with Silver Sevens because it has that vintage feel,” said David Nolan, the property’s general manager. Not that names matter but I dig Silver Sevens. I’ve stayed at a hotel called The D last week. That name is pretty awful but who cares? The D hotel and casino are both great. Silver Sevens reminds me of slot machines. I like slot machines. Terribles Silver Sevens is still an inexpensive hotel option just off the Vegas strip on Paradise. The renovations make Silver Sevens one of the better deals for a near strip hotel. Would you rather stay at The Orleans for $50 a night or a newly renovated Silver Sevens? I’d probably opt for the newer hotel rooms. For $10-$20 more you can get a recently renovated room at the Hard Rock. That’s probably the route I’d go. Here’s a quick 6 second room tour of my hotel room at The D in Downtown Vegas from last week. I love these quick little vine videos that can highlight a hotel room so quickly. Moving forward I will be making these 6 second overviews for every hotel room I stay in. I’ll have a more detailed room tour with video, pictures and comentary from this stay at The D soon. This video hits almost all of the things I felt were important in the room. There weren’t many negatives about this hotel room at The D. If I cared about having a view then I’d be upset that the wrap around the building completely knocked out any potential view. Here are my quick notes for one of the best $40 hotel rooms I’ve had in Las Vegas. Nice TV signal but maybe a bit small. Sweet picture of casino chips. Size was big enough to have a seating area. View of El Cortez negated with wrap. Lamps with outlets (Most useful hotel technology in years). If you follow me on twitter or tumblr you may have seen photographic highlights from my night away. I haven’t done a one night get away in a while and need to get back to taking these little trips. The average daily hotel room rate in 2012 was $108. That may seem high but it includes all of southern Nevada including locals casinos and downtown Vegas casinos which are less expensive than the Vegas strip. 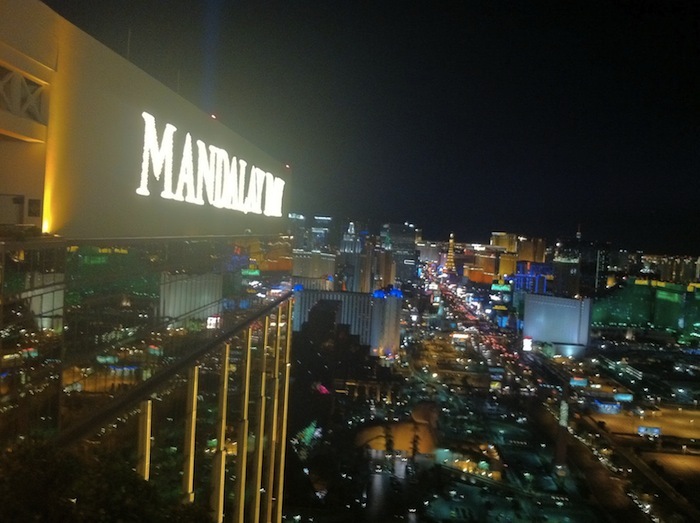 The company (Cosmopolitan) also reported an average daily room rate of $259, well above the $108 Southern Nevada average, and an occupancy rate of 85.6 percent for the year. The $108 average represents room rates from weekends at the luxury properties, like Cosmopolitan, to mid-week rates at downtown Vegas casinos, like the D where I’ll be staying next week, which often run in the $30-$40 range. The Vegas strip is split right down the middle with almost as many luxury resorts as mid-price hotel rooms. I have a couple of posts on which hotels have less expensive rooms in Vegas near the strip and on the strip.